Most people think that bats are terrifying, bloodthirsty animals. This misconception largely comes from fictional films featuring bats or bat-like characters, but because of these imaginary portrayals of bats, these creatures get a pretty bad rap. What most people don’t know is that bats play a crucial role in maintaining the balance of our ecosystem. These animals help to pollinate a large portion of our food supply and control mosquito populations. Unfortunately, bat populations are dwindling due to habitat loss and the spread of a disease called white-nose syndrome. Without bats, nearly half of the fruits we enjoy wouldn’t exist, and insect populations would be out of control. Luckily, there are many organizations working to help the bat population recover. 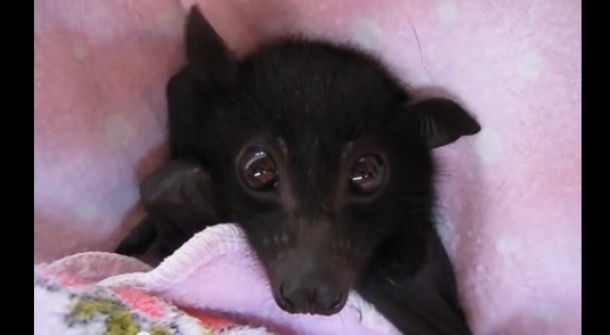 The little bat in this video, for example, was rescued after being discovered as an orphan. She is in the care of a wildlife rehabilitator who specializes in raising fly fox babies and helping to release them back into the wild when they are ready. Looking at the precious wiggling ears on this bat is sure to make you wonder how anyone could possibly think that they’re are scary animals! Don’t her big, brown eyes and fluffy coat remind you of a tiny poodle puppy? Responses to "Think Bats Are Scary? Rescued Flying Fox Wiggling Her Ears is Sure to Change Your Mind"
So cute! world.you for rescuing & explaning how important they are to this world.